I don’t know about youse Pubsters, but moi is in need of solace. Chocolate might work, but I think the following might do the trick even better – with thanks again to Scorpio for providing the gorgeous pics. (For BK) Why are you laughing? No need for any Dutch Calvanism. Imagine how dire attitudes to Aborigines would have been back when he was growing up there and that of the NT police he later joined. Oh sure, but if he had been part of – say – a humanist or a Quaker family – would he have gone in that particular direction? Good morning Dawn Patrollers. It’s been a terrible 12 hours of weather here with trees down, flooding and rescue from flood. Our CFS unit has been in an out all night and is still so. Our power was out from 1800 to 2330. Here’s a personal note from the NT’s “Abu Grahib” boy. Mark Kenny is concerned about Scullion’s startling admission. Time for a ministry reshuffle already? This SMH editorial goes to the shame of the juvenile protection issue and severely questions Nigel Scullion’s performance. Micelle Grattan is sceptical about the reactions of Giles and Scullion. It could have been avoided if politicians had listened. Stan Grant has a contribution on the issue. A Royal Commission isn’t enough says Marcus Storm. Justice Ian Harrison lets fly at the Murdoch press over its treatment of Harriet Wran. Bloody scum! This morning the High Court will hand down its judgement on the banks’ late payment fee issue. Looks like the 60 Minutes story is far from over. This Aussie Muslim mother is concerned about how she will explain Islamophobia to her young daughter. It has to go beyond “the birds and the bees” for these people. Nicole Hasham with the story of doctors taking on Border Force gag orders in the High Court. Nick Greiner has penned a piece about how Sydney’s affordable housing problem might be better addressed. Stephen Koukoulas is predicting an August interest rate cut. More and more is coming out at the Lindt Cafe inquiry. It’s time to recognise that the male breadwinner is an economic relic. The chief of the ACCC has come out and said that privatisation (read certain ideology) has damaged the economy. The Fin Review also has the story. Google. This Professor of Ethics tells us that parochialism is a big problem with the media. Why renewables will win out in the end. Ron Tandberg laments the US political situation. David Pope on the detention centre issue. Not nice. Go to Mark David’s Twitter account and have a look at his seven part explanation of how a certain media outfit works. Trust David Rowe. 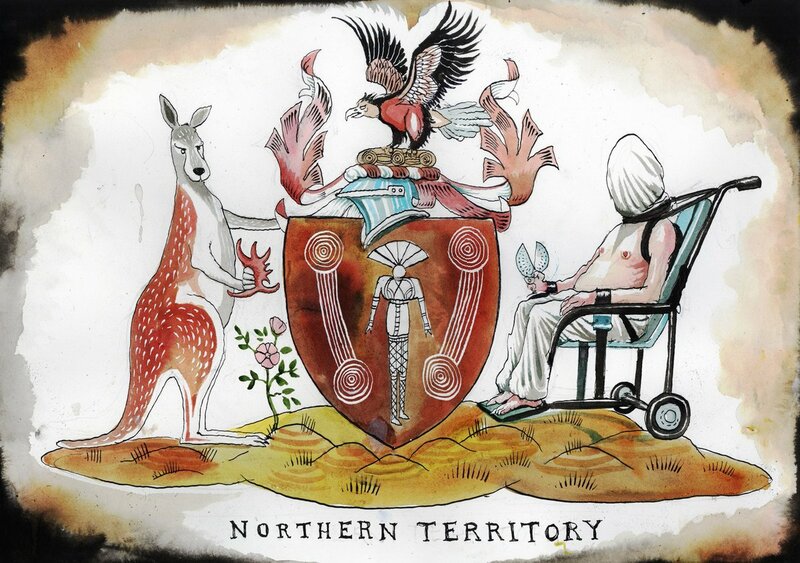 He’s come up with a new coat of arms for the NT. Mark Knight also homes in on the image that will never leave us. Bill Leak at the celebrations for Russian athletes leaving for Rio. I’ll second and third that. Fantastic work! DNC: Here's a series of speakers who could all be president one day. RNC: Yo, here's everyone who didn't turn us down. This guy hunts ducks. Giles, good little lackey that he is, says it was all Labor’s fault. One thing has been made very clear this week – Giles and Scullion don’t give a rat’s arse about indigenous affairs. Scullion said he never knew about the abuse at Don Dale, or anywhere else, because it did not ‘pique’ his interest. Scullion knew the Four Corners program was going to air but chose to go out for dinner rather than watch it. Turnbull had to ring him and tell him to do it. The excuses go on – no-one gave him the Childrens Commisioner’s report, Mick Gooda is just a cranky old man, ehe never saw any footage of abuse. Giles admits he had never visited Don Dale until yesterday and has also told the most blatant lies, claiming he knew nothing about this abuse when his own government, a few months ago, passed legislation allowing the use of restraint chairs on children in custody. Surely he knew why his minister thought such legislation was necessary. Obviously Scullion and Giles love all the trappings of office – the cars, the office, the free flights, the charter planes, the staff, the entertainment allowance, the dinners, the drinks, but have no interest at all in their real work. The Northern Land Council, last month, asked Turnbull not to re-appoint Scullion, because he was so inept at his portfolio, and so biased. Turnbull went ahead and did it anyway. Sucking up to factions in his party to shore up his very wobbly leadership was more important to Turnbull than the needs of indigenous people. Now he has a huge problem on his hands. His first action should be to sack Scullion. He should do that today. Of course, he won’t. It’s now damage control to the max, just a week after the Fizza government was sworn in, with election results not yet finalised and the writs not yet returned. They are off to such a good start, aren’t they . Did this atrocious abuse also happen during the Rudd/Gillard years? Thought so. A disgrace. We’re just as guilty. I never heard Nova Peris say anything about it nor any Labor MP. In 2013, then prime minister Julia Gillard flew into Hobart, flanked by local Labor MPs including Julie Collins, to spruik a Tasmanian jobs package that would include 750 jobs at the Vodafone call centre in Kingston. This blows Giles’ ‘I knew nuffink’ lies right out of the water. He supported the abuse, he wanted it. Did #Guthrie hold the #4corners #dondale #DonDaleKids report back until after the election? Barbaric behaviour. All these people, including Guthrie, have children of their own. Pearson and Mundine didn’t help much either. Coconut = brown on the outside, white on the inside. A RC set up by Turnbull and his cronies will find all punishment for children in NY prisons was legall under NT law, nothing will be done and it will continue. The election next month may change things, in the NT. I’d say that’s fairly unlikely. The consensus seems to be that the CLP is going to face a landslide wipeout on the scale of its 2005 election defeat, at least going by the big swings in Solomon and Lingiari. But still, I wouldn’t mind a poll or two that states as much. Oh Good Grief – now the Revolting Rght are upset about Turnbull deciding on a RC. For the first time in living memory Turnbull shows a bit of backbone and acts decisively, and his detractors in parliament start moaning about it being a ‘captain’s pick’ and whine to journalists. But while Mr Turnbull’s ministers supported his decisive action, others within the Coalition are not so full of praise. 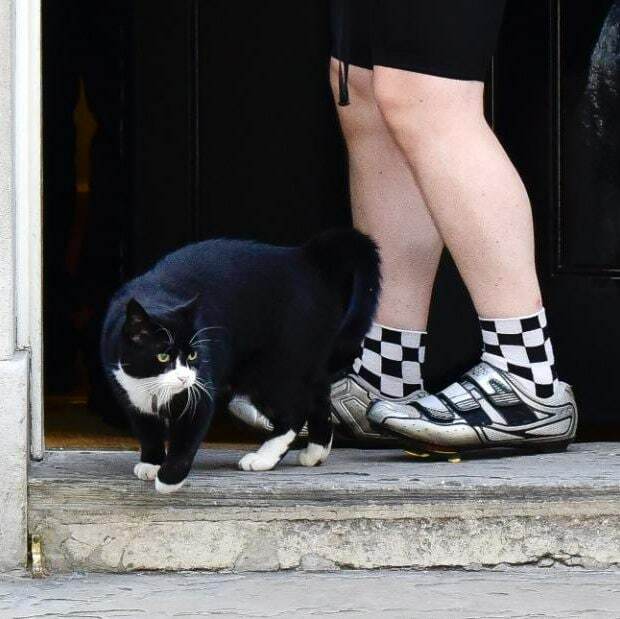 “This is not good government,” said one backbencher from the conservative right of the party who wished to remain anonymous. “This is a knee jerk reaction and is very reminiscent of how Labor in government overreacted to the Four Corners program about the live cattle trade. Another conservative MP, who also asked not to be named, said if the allegations were true then an inquiry should be held – but not from a rushed response. Socialise it a bit? WTF, drinkies at the members bar and laught about the blackfella’s being beaten up? It seems Lisa Singh got elected, and the Greens’ Nick McKim beat the Liberals’ Richard Colbeck. So overall quite a good result. BK if you are about. The church where the latest atrocity in France took place is very adjacent to the military cemetery where your wifes ancestor is buried. I think I can remember it when searching for the cemetery with a busted GPS. I am about Mick. That’s eerie. How sweet . 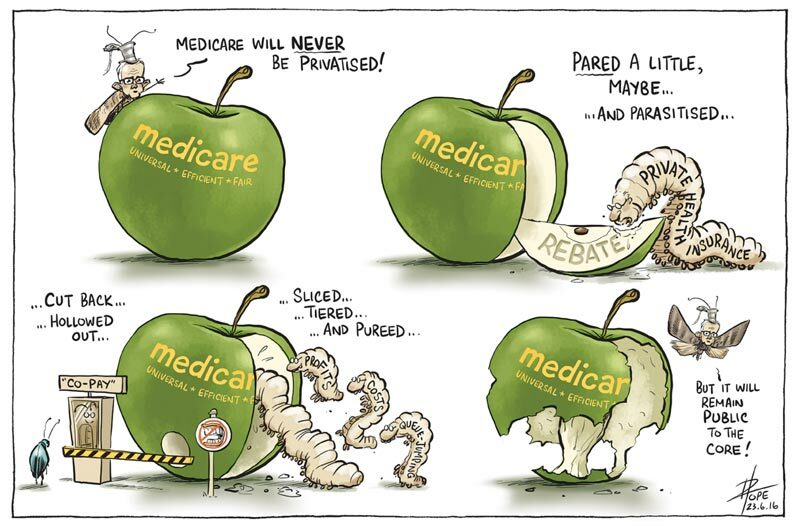 . .
David Pope sees through Turnbull’s Medicare pledge. The recount finished today and I have won by 35 votes, we have the full preference recount to complete and then the seat can be declared I believe. This is the most amazing surreal feeling! A win of this magnitude only happens when great people wth a shared vision come together and work hard. Evidence in Victoria shows boosting access to training has cut the Government’s crime costs, a Melbourne economist says. When vocational education enrolments jumped up three years ago in Victoria, drug crime plummeted by 13 per cent. Assaults and property crime also went down, and researchers said the drop was largely because it gave would-be criminals a new path in life. Comments here will close almost immediately.